So...it’s nearly here! 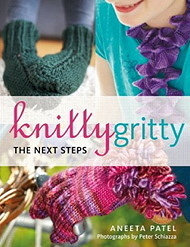 I started writing Knitty Gritty 2 – the next steps way back in April 2010 and it’s certainly been a slog; although I hope we’ll all find it was worth the wait. 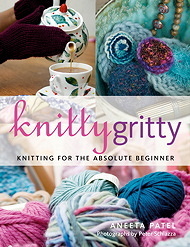 After several delays, there’s an initial print run of 2000 copies of Knitty Gritty – the next steps available from 25th October 2012 with an additional 6000 copies turning up in late November...hopefully enough to satisfy all the knitters out there who have been eagerly waiting for this book (as I have). The very first copies will arrive in London on 10th October and will be available to buy at the Bloomsbury stand at the Knitting and Stitching Show at Alexandra Palace, 11th-14th October. I will be there on Saturday 13th October between 245-415pm on stand M19 if you would like your book personally autographed : ) I’ll also be running a mini Knitting SOS session at the same time so please do stop by with your knitting questions...I’m happy to help! Amazon: For those of you who have pre-ordered from amazon, they should get their copies close to the end of October so you should get your book then. If you're really keen you can already pre-order it on Amazon using this link! Signed books: If you can’t make it to Ally Pally and would still like a book signed, keep an eye on my Knitting SOS newsletters/website/facebook/twitter as Bloomsbury should be organising book signings for November and I would love to see you then. Or if you are too far to travel, I’m happy to sign and post you a copy for £16.99 plus £4 recorded delivery P&P to the UK (email me if you are abroad). Once again I’d like to thank all the test-knitters who worked so hard to make this book really user-friendly, all the companies that sponsored me for beautiful yarn and needles, and especially all my friends and family for keeping me sane during this long project. It really is a group effort and a labour of love for a lot of people. Now comes the fun bit! After the fantastic success of Knitty Gritty - Knitting for the Absolute Beginner, Aneeta Patel is back to teach knitters how to advance to the next stage. With detailed instructions and photographs to accompany you at every step, Knitty Gritty - The Next Steps shows you how to knit lace, how to use beads, and how to read and create charts to knit Fair Isle and intarsia patterns using different colours. You will also learn the secrets of knitting in the round, so you too can knit socks like a pro! Once again, using only plain English, Aneeta teaches budding knitters all the tips and tricks of the trade, so that these patterns are accessible to anyone who has mastered the very basics of knitting. With projects including jumpers for adults and kids, gloves, hats, socks, and an array of seasonal knits, Knitty Gritty - The Next Steps is everything you need on the road to advanced knitting. Here’s some info on a charity project I’m raising money for as a conclusion to the hard work that’s gone into Knitty Gritty – the next steps. I hope you will help me towards working for a good cause and the chance to win what I think is the piece de resistance of my new book. I'm raffling off this Afghan that I created for my second book Knitty Gritty - The Next Steps. The money raised will go to the Genesis Research Trust to help with their promotion of science for the health of women and babies. For more information and a chance to donate and win the afghan, please go to: http://www.justgiving.com/knittygritty Thank you very much! Thank you and I hope to see you all soon!